Background: Present on arrival infection is a common indication for admission of surgical patients initially managed at primary care level. We aimed to describe the demographic and disease profile of patients presenting with infection requiring surgical management, describe determinants of patients’ health-seeking behaviour, and identify barriers to care. Methods: A prospective descriptive questionnaire-based study was conducted at Edenvale General Hospital between February 2014 and October 2016. Minors were excluded. Results: Eighty-nine patients participated. Abscesses (26%), diabetic foot (22%), and cellulitis (16%) were the commonest categories of infection necessitating admission. 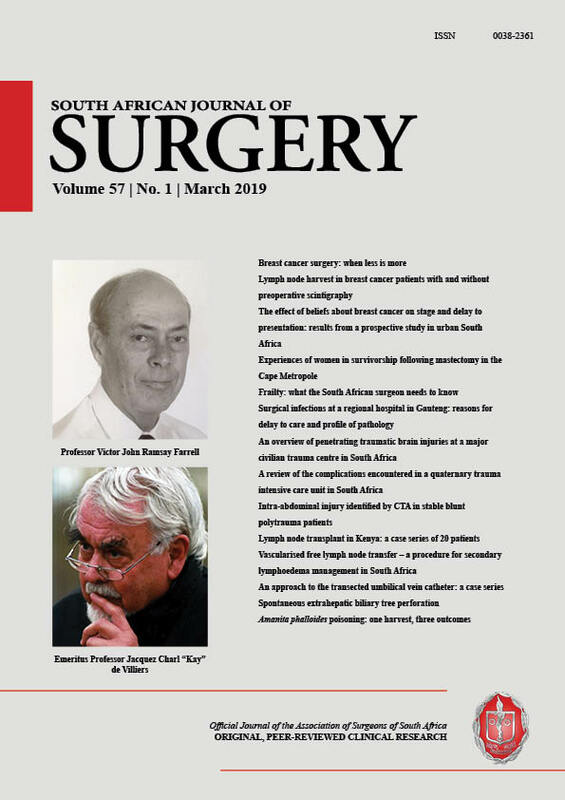 The majority of patients were South African (88%), Black African (82%), males (58%), without medical aid (99%), who were not formally employed (58%), were from poor households (74%), inhabited some form of formal housing (90%), were in charge of decisions regarding personal health (80%), and first sought help at the primary care level (71%). Delay to presentation was noted in 69% of patients, and delay to referral in 46%. Age, race, history of diabetes, and main source of monthly income were significant variables in delayed presentation (p<0.05), and age and level of care on first contact in delayed referral (p<0.05) in the study sample. The most common reason for delay to presentation (84%) and referral (61%) was patients’ belief that their problem would resolve spontaneously. Conclusions: Patients’ socio-economic status, past medical history, demographics, level of first contact with the health care system, and perceptions of their own health contributed to delays in seeking and receiving care in the study sample. These delays may be addressed by interventions that target the availability, accessibility, acceptability and affordability of health care services.